This is a guest post by Jenn Baxter, author of Live a F.a.s.t. Life: How Stripping Down and Cleaning Up Gave Me My Life Back. When you think about decluttering, what comes to mind? Most likely, an image of an overstuffed garage, a dusty old attic or a closet overflowing with clothes. 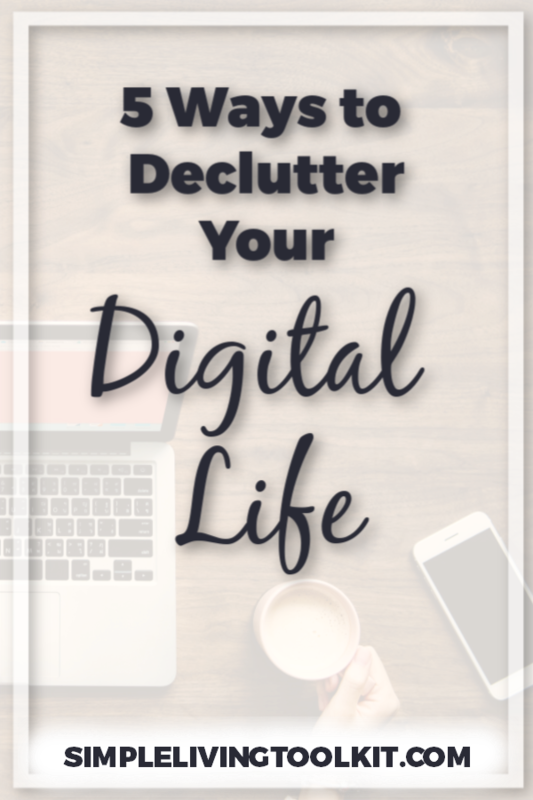 But there’s a whole other world of decluttering that you may have never thought about, that will indeed change your life: decluttering your digital world. Our IRL world may seem like the most obvious place to downsize and declutter. But, even though we may not be as consciously aware of it, our digital worlds can easily become cluttered too. If we’re not careful, our inboxes become flooded with thousands of emails. Our phones become so overloaded with apps that we have to keep upgrading our storage. And even our computer desktops get so overloaded with icons that we can hardly see that beautiful background of a beach cabana anymore. But the cool (and exciting) thing is, our digital worlds are actually easy to declutter and require a lot less heavy lifting than taking all of Aunt Susie’s old cookbooks down to Goodwill. You can do most of these decluttering steps from the comfort of your couch or your bed. However, the freedom and release that you’ll experience afterward will have you feeling like you’ve just run a marathon. You know how it’s easier to cook when you’re starting with a clean, uncluttered countertop? The same is true for decluttering your computer. Before you even dive in to any of the programs or folders on it, you need to start with the first thing you see - your desktop. If you’re anything like me, you’ve probably saved a couple dozen (or hundred) things to your desktop over time that you want to be able to easily come back to. Only problem is, you’ve now saved so many shortcuts, that the time it takes to find anything isn’t so short anymore. Take some time now to go through all of them (yep, every last one) and decide if it’s still something you need. If not, delete it. Remember, these are shortcuts, not the actual files or pages, so you’re determining whether you need to keep a shortcut to it. You can still keep the original file in a folder on your hard drive. Make sure you also go through any URL shortcuts you’ve saved and decide whether you use them frequently enough to warrant a shortcut on your desktop. If not, you can still go into the page and save it as a bookmark on your browser for easy access. After you’ve finished, now arrange the icons that are left into a logical design. For instance, you may want to group all of your personal shortcuts on one side of the screen and all of your business icons on the other. This will also help save you time, which is kind of the whole point, right? If you find yourself sitting in front of a computer that’s so slow you’re beginning to wonder if you’ve time-travelled back to 1980, you may have downloaded one too many freebies or plug-in apps. This is another very common thing that we all do - visit a page and download a PDF (usually to our desktop), thinking we are going to consult it all the time, only to never look at it again. Now is the time to clear out all of those old documents, files, folders and programs that you never use. You can also go into your computer’s temporary files (or cache) and clear it as well for some more speed and efficiency. Feeling uber-gutsy? Go ahead and empty your Recycle Bin too. Gasp! Oh the infamous inbox... where thousands of emails go to die. Now, this one may seem a little overwhelming and it may take a little more time, but I promise you... you can do it and it WILL be worth it! If you have hundreds or thousands (please don’t tell me tens of thousands) of emails sitting in your inbox, don’t you think it’s about time to go through them? Hopefully, many of them are trash, so it’s as simple as hitting delete on those. Mark spam emails appropriately and unsubscribe from any email newsletters you no longer wish to receive. You can also use a free app like “Unroll.me” to consolidate them into a single digest email that will unclutter your inbox. Then, for those emails that you want to keep, set up a few folders for different categories (like bills, family, work, etc.) and file them into the appropriate folder. This will not only help you to find them more easily later, but also keep your inbox clean, which, once you do it, will help you to feel less stressed and overwhelmed. Whether you’re a full-blown social media junkie or just an occasional user, your networking platforms can probably use a little cleaning up too. First, go through and delete any programs that you don’t even use. Then, go through each one that’s left and clean out your “friends” or contacts lists. (You know you don’t really have 1,000 friends in real life... don’t even try.) This is also a great time to unfriend or remove those people whose posts you find offensive or disturbing. You don’t need that kind of thing assaulting you on a daily basis, so get rid of it! Last, but surely not least... your phone - another digital space where we tend to deal with “clutter” by simply getting a faster one or a bigger memory card, when all we need to do is a little decluttering. Go through your contacts list and delete any that you are no longer in contact with or no longer need. If there’s no need to keep all of those old numbers in your phone log, go ahead and delete those too. Delete old, unneeded text messages and save any that you do want to keep to the Cloud. If you have tons of photos cluttering up your phone, clear them out by getting rid of ones you don’t need and downloading ones you want to keep to a digital photo frame or a photo printing app. Most importantly, go through all of the apps that you’ve downloaded to your phone and delete any that you haven’t used in the last three months (or ever). Not only will your phone start to feel cleaner and more organized, but you’ll miraculously have a faster phone without the upgrade fees! Jenn Baxter is an accomplished speaker, freelance writer and the author of the book, Live a F.a.s.t. Life: How Stripping Down and Cleaning Up Gave Me My Life Back, which is available here. She has been published in numerous print and online publications and appears at tiny house festivals, healthy living festivals and private engagements across the country, speaking on the subjects of downsizing & minimalism, clean eating, healthy living and spiritual health. She appeared on HGTV’s “Tiny House Big Living,” is a regular guest on the NBC morning show “Charlotte Today” on WCNC-TV and has also appeared as a guest on several tiny house-themed podcasts including The Purpose Show, the Tiny House Podcast and Tiny House Canada. Visit her website to learn more.